Patrick B. Healy is a partner in the Fort Wright office of Lewis Brisbois and a member of the Medical Malpractice Department. He is admitted to practice in Ohio, Kentucky and Indiana. His time will be devoted to representing companies involved in civil litigation, including: insurance matters, premises liability, catastrophic injuries, and medical malpractice. In addition to general liability claims and medical malpractice defense, Patrick handles environmental claims in Indiana, Ohio, and Kentucky. For example, Patrick is currently defending a claim outside of Gary, Indiana involving the alleged design, construction and maintenance of a wetland mitigation bank. Patrick earned his law degree from Chase College of Law in 2008. 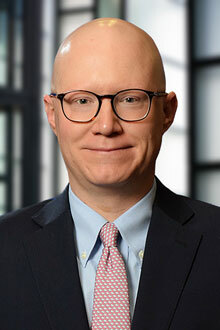 While at Chase, he participated on the National Trial Advocacy Team, was a member of the Student Bar Association and received the Bratton-Wirthlin Award for Excellence in Trial Advocacy for the 2006 – 2007 academic year. During his time at Chase he also clerked for a preeminent medical malpractice firm. Patrick is a 2005 graduate of DePauw University where he was an Economics & Management major and an active member of Sigma Chi Fraternity.